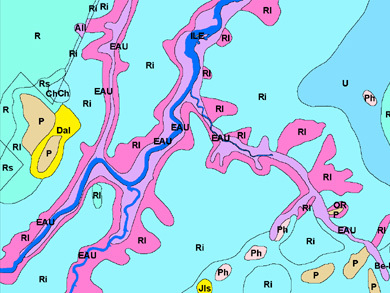 The Soil survey report maps (1:20,000) produced by IRDA characterize Quebec soils according to their morphological, physical and chemical properties. Each digital soil map has a corresponding help file, a lengend, pedological annotations, and the descriptions of the attributes. In addition, a complete database of Quebec soil descriptions is provided. Author Institut de recherche et de développement en agroenvironnement Inc.
Index Map Quebec Soil Survey Map Index (IRDA) of the datasets available at the GIC. Access Members of the McGill Community can obtain copies of the data by filling out the Geospatial Data Request Form. Please include the title, Quebec Soil Survey, and the desired map numbers (ex: 31H05NO). Citation [IRDA Digital Soil Survey Report] Map Number. [computer file]. 1:20 000, Sainte-Foy: Institut de recherche et de développement en agroenvironnement Inc., year.